This year, to celebrate our great nation’s independence, I headed south, to home, to Miami. On my to-eat list was just one category: Cuban food. Sure, I could probably find Cuban grub in New York (afterall, what country’s cuisine isn’t represented), but in Miami it’s everywhere. Literally. Every block has a Cuban sandwich shop, restaurant, coffee shop, food-by-the-pound place, food cart, or old lady selling the stuff she cooked up at home. And I missed that. I’m not Cuban but I sure love the food. Saturday morning, when my sister asked what Flaneur and I wanted for breakfast I was quick to blurt out my answer: “Cuban!” It didn’t matter from where really (most places in Miami are good) but I had a few things in mind. First, was the simple, the classic, the oh-so-perfectly done mix of salty, sweet, crunchy, and soft: the tostada cubana y cafe con leche. 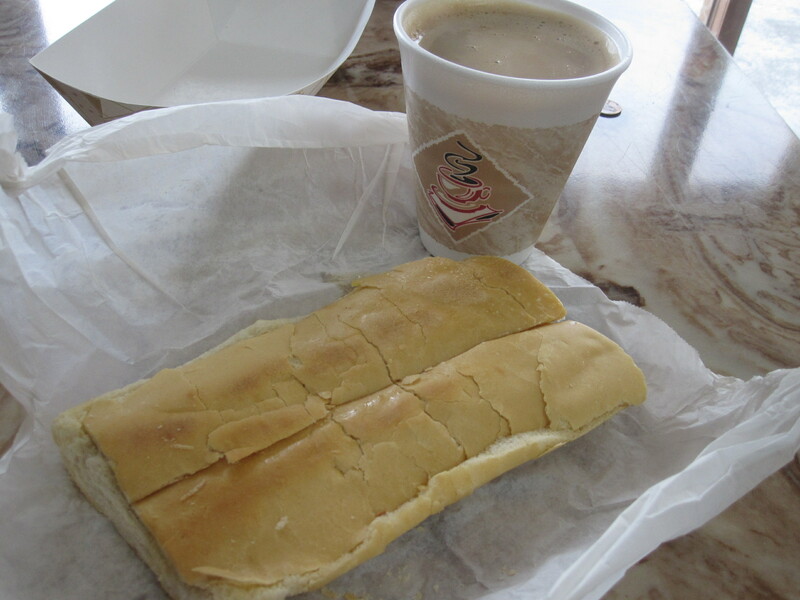 On a literally translated, very basic level, all that just means Cuban toast and coffee with milk. But really, it’s so much more than that. The toast, first of all, is made with Cuban bread, which is a long baguette style loaf of crunchy-on-the-outside, soft-and-doughy-on-the-inside bread. A big hunk of it is cut off, sliced open and then heavily buttered (it should be gooey and yellow with butter) before being put back together, and flattened in a sandwich press. Then, the cafe con leche is made with Cuban style espresso and a lot of milk (way more milk than coffee, so that it ends up looking like chocolate milk) and a copious amount of sugar. No Splenda, no Equal, just plain ol’ tooth decaying white sugar. The good stuff. Finally, you take the buttery, salty, crunchy toast and dip it into the creamy, sweet coffee for just a few seconds, long enough that it can act as a sponge and absorb the coffee, and voila! Deliciousness! 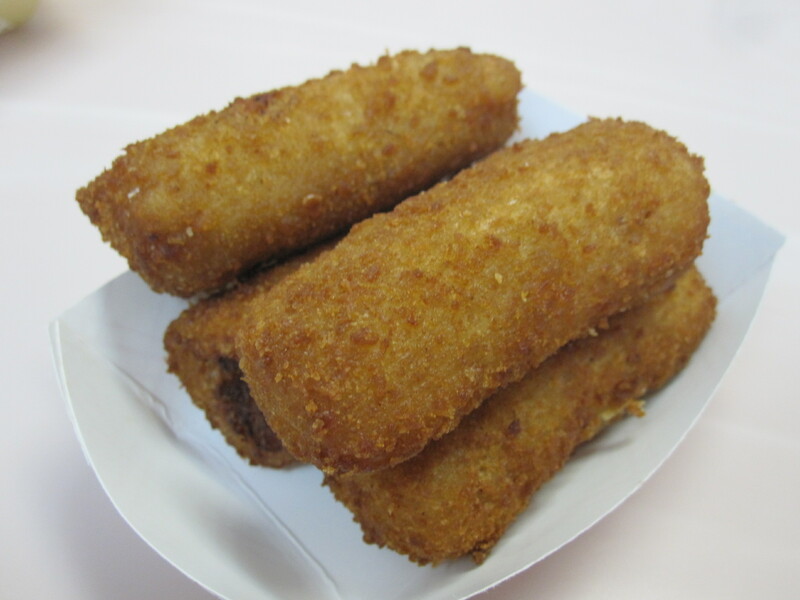 Next on my breakfast must-haves list were croquetas de jamon, plump little croquettes with a warm, creamy ham filling. Some people like to eat these with saltines and a few drops of hot sauce but I prefer to just eat them plain, in all their yummy, breaded glory. They’re basically the finger food of comfort food. And finally, there was the dessert portion of my Cuban breakfast. (Yes, breakfast can have dessert too.) 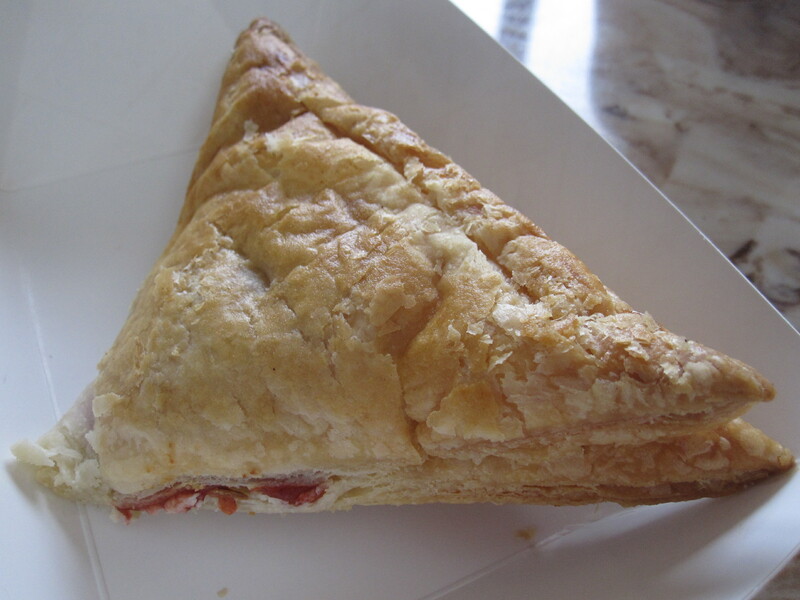 Pastelitos, literally little pastries, are a staple of not just Cuban households in Miami but anyone with a stomach and functioning taste buds. They’re available with all sorts of fillings but my favorite are guayaba y queso, guava and cheese. For those of you who don’t live in Miami, or maybe even Florida, or for some other reason just don’t know what guava is, it’s a tropical fruit with a reddish-purple inside. This particular pastry, made with flaky, crispy layers of dough, was filled with guava jelly and cream cheese, making for a mouthful that’s sweet and tangy with a buttery crust. Sometimes it’s the little things that make you miss home the most. This entry was posted in Breakfast/ brunch and tagged cafe con leche, croquetas de jamon, Cuban food, Miami, pastelito de guayava, toast, tostada. Bookmark the permalink.